Mersenne@home is a research project that uses Internet-connected computers to find Mersenne prime numbers. This article on Wikipedia provides more information about these numbers. You can participate by downloading and running a free program on your computer. 2010-12-25: I am pleased to inform you that we have a preliminary version of an application for Windows. It is not too fast, but should work on most recent versions of Windows. 2011-04-23: Mersenne@home - Discussion about scoring. I invite everyone interested, to participate in discussion, to this thread. I am happy to announce the release of 64-bit application for Windows. 2011-11-25: I started to to deploy a highly optimized versions of applications. For supported platforms, they brings a significant increase in performance. If you see that there is available optimized application for your computer but for some reason you do not get it. Or worse, you get an application that is not compatible with your computer fill out a thread on the Bugs forum or send me a private message. I also encourage you to share the results of the performance of these applications on the Number crunching forum. I regret inform that unfortunately I have no further possibility of engaging in and maintaining the project. Therefore, I decided to turn it off. I'm sorry that it did not give this information earlier, but I was hoping that maybe is possible to do something so that this did not happen. I would also like to thank all the volunteers and the BOINC community for your support. 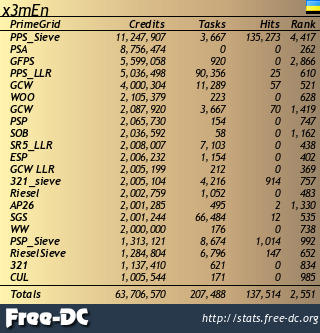 I also encourage everyone to continue support other BOINC projects, and those particularly interested in the subject of Mersenne numbers, to the GIMPS project. At this site you can find all the divider from the project database. It will remain available for some time. Once again, I would like to thank all of you and good luck.